Catholic News World : Wow Amazing New Catholic Video Series for Kids! The Opus Joyous Show - #CatholicKids! Wow Amazing New Catholic Video Series for Kids! 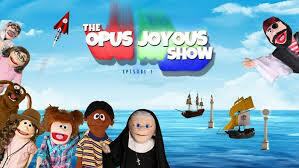 The Opus Joyous Show - #CatholicKids! Opus Joyous Studios is excited to announce the release of their debut production, Episodes 1-4 of The Opus Joyous Show. It's an engaging, entertaining and inspiring Catholic video series geared towards children aged 5-12. Rich in Catholic teaching and symbolism, this adventure based series features a cast of fun, entertaining and musical puppets as the main characters learning to embrace their Catholic faith while setting out to stop the evil villain Captain Barnacle and his shady plan for utter darkness upon the world. At the heart of it, the story is about spiritual battle and our response as Catholics. Other themes include vocation, intercessory prayer, using the gifts God has given us, the sacraments and more. In addition to the main storyline continued through the 4 episodes, the Opus Joyous Show also features a debrief teaching session at the end of each episode lead by the loveable, quirky and high-energy Sister Mary Kate! The Opus Joyous Show will bring you to the edge of your seat while the characters heroicly respond to Christ's call to bring his light to the world. Head out on a high sea voyage, travel through time collecting relics from the life of Christ, meet Mother Mary and learn about the Catholic faith in this epic new Catholic adventure series like no other! Visit https://opusjoyous.com to learn more.